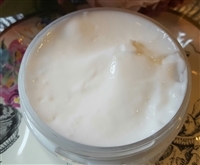 A light hand and body lotion for a non-greasy layer of moisture in a 4oz jar. Mounds of sugared frosting, white cake, and a hint of strawberries whipped into a light hand and body lotion. 4 ounce size. Blueberry crumble blends with brown sugar and sweet black cardamom tea whipped into a light hand and body lotion. 4 ounce size. Strong lavender blended with vanilla bean custard and hints of marshmallow and caramel whipped into a light hand and body lotion. 4 ounce size.